RECEIVE YOUR FREE 'How to Live Your Best Life and Thrive' CONSULTATION WITH NIKKI NOW! WANT TO KNOW HOW TO THRIVE, NOT JUST SURVIVE? We provide extremely useful information and tools that will help you improve many areas of your life. Based on the nineteen-billion-dollar industry within the self-development market sector (consider the phenomenon of The Secret ) Nikki Arnold JP is an author, speaker, coach, and director of Inspired Living International. She is also a member of a number of writing and critique groups including Writers Guild, Writer Circle, Writing Tips, and Creative Writing Critique Center. Nikki has been happily married to Durban for eighteen years and is the mother of two beautiful, healthy children. The couple had humble beginnings. Durban had only been in Australia for a few years after arriving from Zimbabwe and was a barman and university student at the time of their marriage. Nikki was an executive assistant for over twenty-two years, significantly contributing to the effectiveness and success of high-profile CEOs, in addition to principals of independent/private girls’ schools. She worked long hours, with little or no flexibility, paid high taxes, and, in some instances, helped to build someone else’s wealth. Nikki and Durban both had dreams of a better life, goals to further their careers and set a good example for their children, a desire to live a life of financial freedom so they could regularly donate to worthwhile charities and causes, and, most importantly, provide an excellent education for their children. Nikki learned many skills, confidence, resilience, positive thinking, and action in her prestigious career by observing incredible, inspiring, high-profile, successful people. Durban, a very capable, competent, quick-learning, and hardworking man, achieved his career goal to become a CEO himself, at a very young age. They have gone from having practically nothing to applying their skills and lifelong lessons to build an incredible, very fortunate, successful, blessed life for themselves and their loved ones, creating an extraordinary life without limits. Nikki’s passion is to share her many insights with others to help them live the best life possible. She empowers others to reach their highest potential, to have courage, to believe in themselves and live a fulfilled, successful, positive life. “It’s amazing, once you have planted that seed and given someone more knowledge, resilience, confidence, and self-belief, helping them remove baggage, self-doubt, and predetermined thoughts to change their situation, follow their dreams and goals, and live a more fulfilled life,” she says. Nikki is a mentor and coach to a number of people, but she aims to use her writing to share beyond the scope of those she can coach in person. 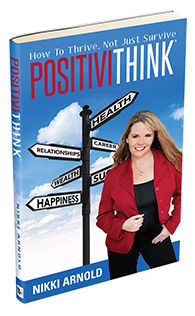 PositiviThink™: How To Thrive, Not Just Survive, will help others become more positive, learn how to master their emotions and energy levels, accept what they cannot change, and equip them with new tools to go after what they want and create a better life for themselves.